My talk today could be thought of as a contradiction of the theme of the session it is part of – the ‘curse of short-termism’. For, if there is one area of public policy where Ireland could be said to have had a consistent long-term focus, it is in regard to education. Fifty years ago this month, Taoiseach Seán Lemass appointed Donagh O’Malley as Minister for Education. Two months later (10 September 1966), O’Malley made his famous speech to a meeting of the National Union of Journalists promising to introduce free secondary education and a free school transport system for the following September. That promise was fulfilled and set Ireland on a path of educational expansion which has continued more or less unbroken to this day. The numbers of pupils and teachers in the second level school system doubled within a decade after O’Malley’s scheme was introduced, participation rates soared, especially among the small farming and urban working classes, and the groundwork was laid for the expansion of third level education which began slowly at first and took off from the 1980s onwards. There have been many twists and turns in the evolution of education policy over the past fifty years. There was a time in the 1980s, during Ireland’s economic downturn of that decade, when some commentators questioned the wisdom of pouring public money into the education of young people who would emigrate as soon as they got their diplomas. Yet, serious questioning of investment in education never set in and the steady, unbroken nature of the growth of the system over the decades since the 1960s has been a striking feature. The consequences of this long educational revolution are that today over 90% of the age-cohort finishes second-level education or something akin to it in the form of post-secondary training, and the proportion of young adults (ages 25-34) with a third-level qualification is among the highest in the EU at around 54%. Over the past fifty years, in other words, Ireland has gone from being a slow starter to a leader in Europe in the education its young citizens. Another striking feature of this record is just how many young citizens there are who need to be educated, and this is the aspect of Ireland’s educational record I want to dwell on today. In recent weeks, there has been much talk of how the expanding demand for third level education is to be funded – this in a context where public expenditure per student in third level education fell by over a quarter in real terms between the peak of the boom in 2007 and 2013, and where pupils in second-level schools now receive more funding per head than do their counterparts in the third-level system. My concern today, though, is not so much with the educational or funding aspects of the educational revolution as with its demographic underpinnings, that is, with the expansion in the population of young people from which the rising stream of entrants into the education system is drawn. 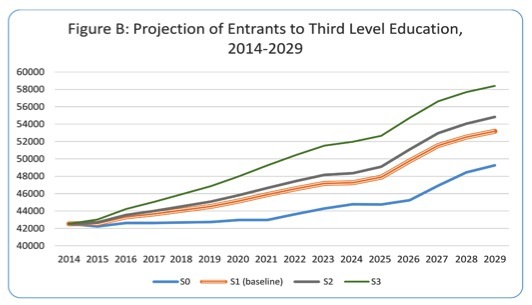 The Dept of Education and Skills has projected that if the rate of transfer from second to third level education and mature student entry rates remain as they are today (the S1 Baseline scenario in the graph below), the equivalent of the current student population of UCD will be added to the system in the next ten years, driven solely by demographic growth. If there is an increase in transfer from second level to 70% and mature student entry increases by 25%, that would add a further large number, equivalent to today’s student population in Trinity College Dublin. Source: Dept of Education and Skills (2015) Projections of Demand for Full-Time Third-level Education, 2015-2029. Worry as we may about how to cope with this growth, we should remember that it is a problem many EU states would love to have. 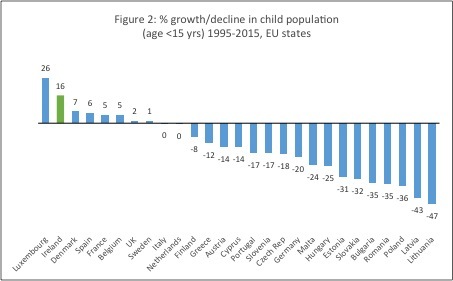 Falling birth rates have caused the child population in most EU states to shrink over the past two decades while Ireland’s has grown by 16%, second only to the growth rate in Luxembourg (Figure 2). Decline has occurred at a catastrophic rate in eastern Europe, and even in Germany, the supposed powerhouse of the EU, the child population has fallen by a fifth since the mid-1990s. These countries, then, face the prospect of an emptying out of schools and colleges, or at least a sparser level of attendance in the ones they have. Over the years, Ireland’s birth rate has gone through its own gyrations but nevertheless it stands out because even its downswings bottomed out at a reasonably high level (Figure 3). We had had our last big downswing during the 1980s, but had Ireland been like other Catholic countries in the western world at that time (such as Portugal, Spain, Italy and Quebec), the downswing would have gone on longer and been steeper, bottoming out perhaps well below 40,000 per year rather than the actual lowest level of just under 50,000 recorded in 1994. It would also have stayed close to that level instead of the bounce back to over 75,000 which had happened by 2009. A new downswing is underway at present in the aftermath of the recent great recession but it has so far served only to bring annual births back to the level of ten years ago and still leaves Ireland with one of the highest birth-rates in the developed world. I will comment here only on one aspect of the vitality of Ireland’s birth rates: the degree to which it is driven by the unusual willingness of the Irish middle class women to have large families, as long as they are married. Today, as in the past, levels of childlessness among women in Ireland are quite high by international standards and are associated especially with non-marriage. In 2011, almost one in five Irish women reached her mid-40s without having had any children and most of these were single. But today too, as in the past, women who have children tend to have more than the norm for other developed countries, and middle/professional class women in Ireland particularly stand out for their tendency to do so. We can get a sense of this pattern and what it means for education if we look at differences in children’s family size by social group in Ireland in 2011 and compare it with the corresponding pattern of forty years previously (Figure 4). By ‘children’s family size’ I mean the average number of siblings in the child’s sibling group, which in statistical terms is somewhat different from the average number of children women have since calculation of the latter average typically includes women who are childless and does not adjust for the effect that bunching of children into small numbers of large families has on the distribution of children by family size. Looking at the pattern for 1971, two features stand out: the large size of children’s family size and its fairly flat distribution by social class. 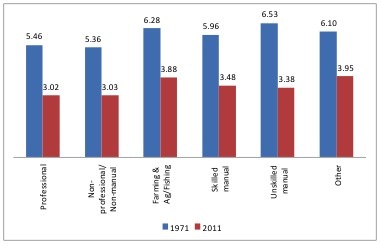 Children in the professional class had one sibling less on average than those in the unskilled manual class but this was a modest difference in light of how big families were even in the professional class. The mean sibling group in the latter class was between five and six children, a mean family size that by then had long since disappeared among the professional classes in the developed world generally. It is especially striking to note that in that year, children from farm backgrounds, who were the most enthusiastic participants in the education revolution then getting underway, typically came from families where there were six or seven siblings. Economists often talk of the ‘quantity-quality’ trade-off that underlies the modern decline in family size, as families choose to have fewer children so that they can invest more in each child. In Ireland in the 1970s, however, families went for quality even while they still had the quantity, and the large size of families proved to be no obstacle to the rapid expansion of educational participation that took place. * Mean number of siblings in the child’s sibling group. Source: Calculated from 10% sample, Census 1971 and 2011 (Integrated Public Use Micro-data Series International, University of Minnesota). When we come to 2011, we find that children have fewer siblings but not as few as we often think. It is true that the average woman reaching her mid-40s in Ireland in 2011 had just over two children and that makes us think of the two-child family as the norm. But when we factor out childless women and give due weight to women who had three, four or five children, we find that the average child in this period grew up in a family of 3.3 siblings and almost 40% were in families of four or more siblings. Furthermore, in 2011 as in 1971, the smallness of the differences in sibling numbers by social class stand out – children of the middle and professional classes had only marginally fewer siblings than those of the unskilled manual class. Children in the former classes typically were one of three siblings, with substantial minorities belonging to families of four or five siblings. That even today, children come from families of such sizes makes it all the more notable that Ireland’s educational revolution has progressed as far as it has. To put it the other way around, developed countries where family sizes are much smaller than they are in Ireland does not seem to give them any advantage in getting their children through the education system. These features of the demographic foundations of Ireland’s strong record of educational expansion raises the question whether Irish public policy should be taking steps to sustain that record. Having had such a long history of demographic weakness in the early decades of the state’s existence, should we be doing anything to sustain its current phase of relative demographic vitality? There is no easy answer to that question since one thing we know from the history of efforts by states in the developed world to encourage women to have children is that those efforts generally make little or no difference. Ireland itself, is a demonstration case for the opposite reason: the rebound in its birth rate since the mid-1990s occurred in spite of the absence of state efforts to bring it about. For example, child benefit was quite meagre until the early 2000s, there was no state-funded childcare, and the cost of private childcare was among the highest in the developed world. Yet women – and most notably middle/professional class women – went ahead and had children anyway and did so to a greater degree than in the Nordic states or France where public provision in these areas was generous. One point we might draw from Irish family patterns is the justification they give for universal child benefit, the one universal form of social security provision we have in this country. Child benefit can be thought of as a transfer from those who do not have children to those who do and thus as a contribution to the social good that children represent. The family patterns just described mean that the burden of rearing children is quite evenly distributed by social class in Ireland but is unevenly distributed within each social class. This on its own is an argument in favour of the horizontal transfer of resources that child benefit represents.